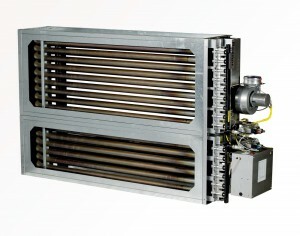 Low Pressure Hot Water Batteries are manufactured for slide-in application within the modular unit casing and would comprise 1/2″ or 5/8″ OD seamless copper tube mechanically expanded into flat or corrugated aluminium or plate fins. The copper tubes would be brazed into copper headers fitted with brass BSP male connections to suit the predetermined connection handing. The battery fin block will be circuited in contraflow arrangement and pressure tested on completion to 15 bar with dry air under water. Battery casings are manufactured from hot dipped galvanised mild steel for normal commercial applications. Alternative materials such as copper fins, vinyl coated aluminium fins, electro-tinned copper fins and stainless steel casings are available for use in healthcare or similar applications that call for specific construction requirements. Chilled water and direct expansion cooler batteries are constructed from similar materials to those used in the manufacture of L.P.H.W. heater batteries. Cooler batteries are provided with perforated bottom casings for facilitating the drainage of condense from below the finned block, return bends and headers. 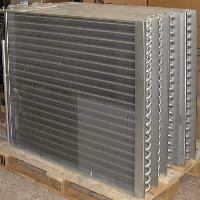 Where finned blocks are over 1200mm high, intermediate drip trays will be incorporated to prevent moisture ‘carry over’. Cooler batteries are arranged for slide-in application over purpose designed condense collection trays fitted with a drain connection and formed to slope to one side to suit the predetermined unit connection handing. The battery fin block will be circuited in contraflow arrangement and pressure tested on completion to 15 bar with dry air under water for CW batteries and 30 bar for DX batteries. Electric heater batteries comprise sheathed type heating elements constructed from spirally wound nickel chromium resistance wire, insulated by compacted magnesium oxide powder and housed within stainless steel tubes. The element ends are sealed with silicone rubber and fitted with a quick connection terminal or linked with a copper busbar. The individual heater elements are banked into stages on to a galvanised mild steel IP30 terminal box via air tight fixing glands and arranged to suit the pre-determined control requirement (stepped or thyristor) of the heating system. 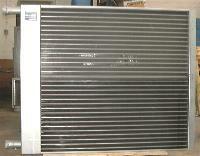 A manual reset bi-metal high temperature safety cut-out thermostat is provided as standard to each heater assembly. ‘Direct’ or ‘In-direct’ gas fired heaters are available and are purposely designed to suit each particular application. 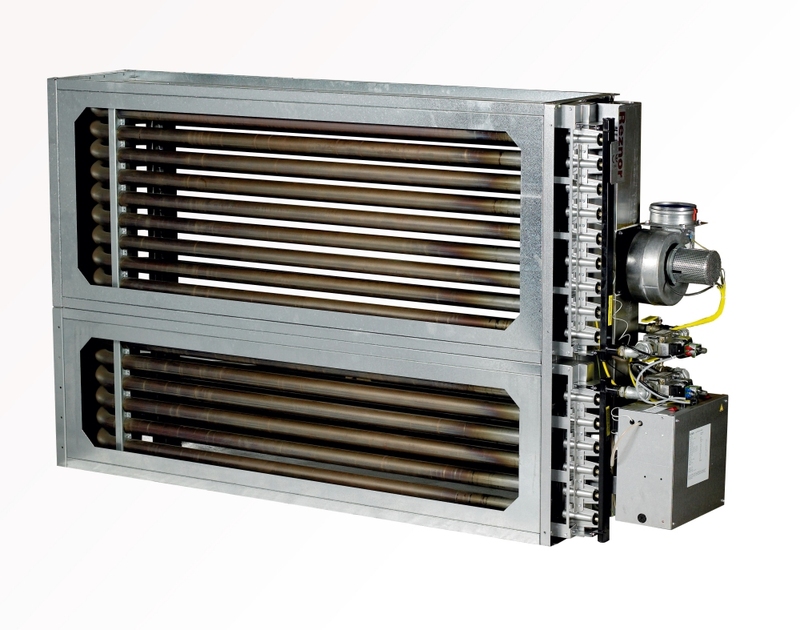 In-direct gas fired heaters suitable for mixed recirculated – fresh air applications are available with either clamshell type or very high efficiency tubular design stainless or aluminised steel long life heat exchangers, depending on performance requirements. Gas heaters range from 11kW up to 900kW and would comprise approved room sealed flued appliances utilising atmospheric burners with fan assisted combustion air and powered exhaust ventilation. Heating capacities can be stage controlled for either on-off, high-low fire or for close temperature applications, by means of modulating control with limited minimum heat outputs. Direct gas fired heaters are generally applied to full fresh air make-up applications normally associated with factory process use. Standard burner modules available range from 50kW up to 1000kW and assembled with side mounting plate fitted with approved gas valve train providing safe gas ignition & combustion control features and modulating temperature control. Burner assemblies would be housed within purpose designed modular unit sections fitted with adjustable profile plates and stainless steel burner head.